If I am looking to enjoy my drinks as well as my night, but still want to keep it low carb I am most definitely making this Apple Cider Moscow Mule! I'm not even a fan of apple cider vinegar, in fact, I would normally refuse to drink it. But some simple ingredients transform the gross taste of vinegar into a heavenly, low carb cocktail! Make this drink any night of the week to let go of all that stress and indulge, guilt free. Honestly, I would drink this all year round. 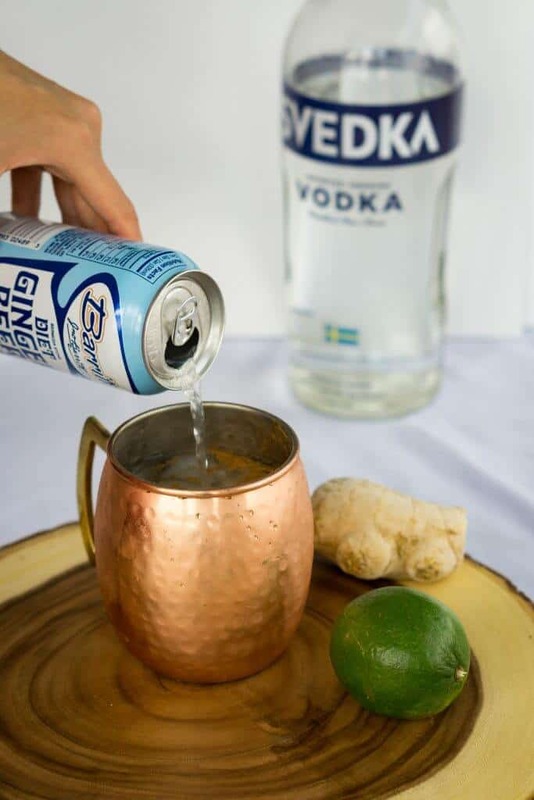 However, when the cold weather starts to kick in and you're looking to get a little frisky, but don't want to be holding a freezing cold drink this low carb, spicy version on the moscow mule could be your go to! I've personally never tried it warm, but I'm most positive you could warm all the ingredients, except the ginger beer on the stove top and then add in the ginger beer at the end. Warm, cinnamon and filled with vodka! What's not to love?! Aren't We All Looking For Low Carb Drinks? Let us be honest for a second, there aren't a ton of great low carb beer options, especially when it comes to taste, wine can add up in carbs quickly and plain liquor can be dangerous. With that said, aren't we all looking for low carb drinks that are delicious and won't get us too easily drunk? Well, I can assure you this apple cider moscow mule is going to be your new best friend, but if this isn't your cup of tea you can also make our low carb mojito! If you do always find yourself itching for a beer, check out our blog post and video with your best low carb beer options. What I love most about this drink is how simple it is to make and how common the ingredients are. Maybe you're thinking you've never seen diet ginger beer, but trust us, it's there! We've seen it in multiple grocery stores as well as all liquor stores. However, if you truly are struggling to find it we know you can easily find diet ginger ale! That plus some fresh grated ginger and you're in low carb cocktail heaven. You can even opt to leave out the cinnamon, but we think you're going to at least want to give it one try - this apple cider moscow mule as we've made it really is the best low carb drink you're going to ever make! Recipe can be quickly added to MyFitnessPal - Search "KetoConnect - Low Carb Moscow Mule"
In a glass combine the vodka and apple cider vinegar. Squeeze the lime juice into the glass and toss in the wedge. Add the ice cubes and sprinkle on the cinnamon. Top of the mixture with as much or as little diet ginger beer. NOTE: a great substitute for diet ginger beer (which can e found in many groceries and liquor stores) is diet ginger ale!